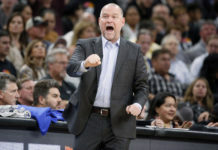 The Denver Nuggets may not be atop the NBA Standings, but it isn’t all doom and gloom for the young basketball squad. On Wednesday, PG Emmanuel Mudiay and C Nikola Jokic were both selected to represent the World Team for The BBVA Compass Rising Stars Challenge on Feb. 12. The game is an opportunity for rookies and second year players to showcase their skills during the NBA All-Star festivities. Mudiay, the seventh overall selection of the 2015 draft, has averaged 11 points and 5.7 assists per game this year for the Nuggets through 31 appearances and 29 starts. Jokic, a 2014 second rounder, has contributed 9 points and 5.4 rebounds in his 43 appearances. He has started 19 games. Mudiay and Jokic will be joined on the world team by the likes of Andrew Wiggins, Dwight Powell and Bojan Bogdanovic. The US squad will feature, among others, Karl-Anthony Towns, Jahlil Okafor, Nerlens Noel and D’Angelo Russel. The pair have provided scoring and size for the Nuggets this season, a good sign of things to come for the future. While the Nuggets still have a shot at a top-five pick for the 2016 NBA draft, they sit only three games out of a playoff berth. Mudiay may offer the Nuggets a long-term solution at point guard. 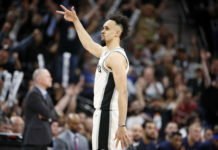 He has shown flashes of elite scoring ability (26 points against the Suns in November), and also demonstrated exceptional vision and playmaking ability. 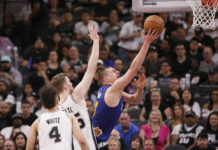 Jokic has demonstrated he is capable of playing down low against some of the NBA’s premeir big men. The Serbian combines an effective post game with the ability to shoot from beyond the arc; Jokic is 10 of 28 from three-point range this season. While Jokic has effectively solidified himself as the Nuggets’ center going forward, Mudiay is still facing competition for the starting point guard job. Veteran Jameer Nelson, currently sidelined with a wrist injury, has been relied upon to run the floor while the rookie Mudiay learns the ins and outs of playing in the NBA full time. Jokic, Mudiay and the Nuggets face of against the Boston Celtics Wednesday at 5:30 PM MST, and don’t miss the Rising Stars game Feb. 12.